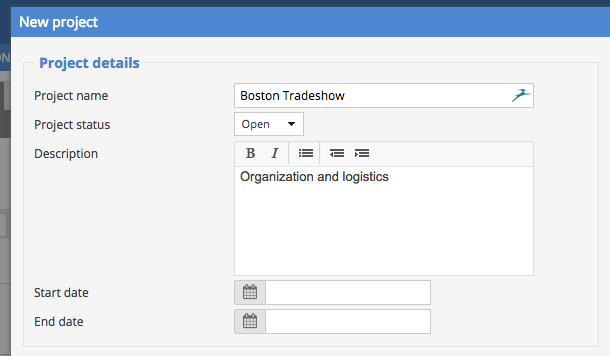 Sellsy's project management add-on lets you organizes your projects very freely as lists and entries. To create your first project, click on Projects and then click New Project. 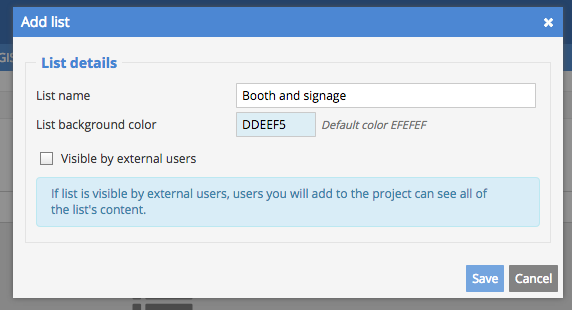 In the next window, enter the details of your project. If you have global custom fields for your projects, you can add them at this point in time. Your project is now created, you can create your first list by clicking close on the Add list button. Name your list. You can choose the background color for your list to help you better organize. You can also decide to make the list visible to external users (customers, partners, etc.). Repeat these steps for other lists in your project. You can now add entries to your project. To quickly add a new entry, click Add entry at the bottom of the list. In the above example, we have assigned a label, entered a description, and created a checklist of suppliers from who we expect an answer. Many options are available, all which are detailed in the following article. The label as well as a summary of the entry is displayed (such as the checklist above, with 2 of 4 items checked). Your first project is now created. Please read the following directions to learn more about advanced features in the project management add-on.